The Wheatgrass Book: How to Grow and Use Wheatgrass to Maximize Your Health and Vitality. From the juice bars of California to the health spas of New York, wheatgrass is fast becoming one of the most widely used supplemental health foods. Loaded with natrual vitamins, minerals, chlorophyll and enzymes which feed your cells and help rid them of toxins, wheatgrass is perfect for dieters, athletes, people on the go, and anyone who suffers from pain or illness. 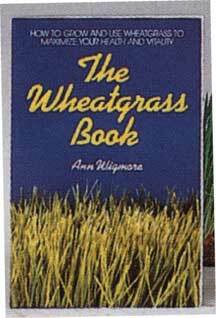 Written by Ann Wigmore, the woman who introduced wheatgrass juice to America thirty years ago, this book contains all the practical information you'll ever need to grow and use your own wheatgrass for only pennies a serving. 126 pages.